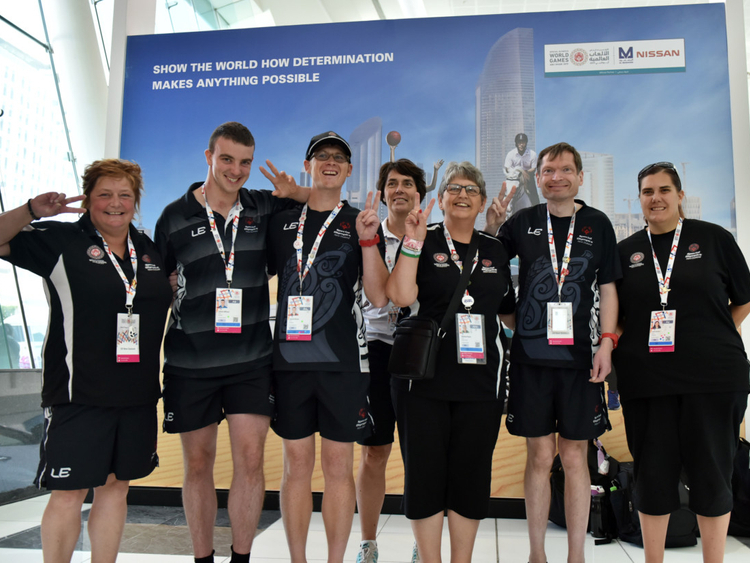 Abu Dhabi: Kiwi spirit will live on and the UAE’s message of tolerance at the ongoing Special Olympics is what’s needed during these testing times, according to New Zealand Special Olympics medallists, as they dedicated their medals to the victims of the Christchurch mosque shootings that claimed 50 lives on Friday. “All my medals are for them,” said James Wilson, who has won four so far, all silvers in powerlifting for squat, deadlift, bench press and overall. “Hopefully these medals will make people happy back home. I also want to tell everyone, I have worked really hard,” added the 27-year-old from Auckland. Wilson’s coach Glen Ryan said she didn’t believe that Wilson would respond so well. “Wilson has surprised us all and he has actually performed exceptionally well,” he said. “We are a total team of 64 including 43 athletes and to win 15 medals so far, given the circumstances is very good. “Everyone have given their best along with these medal winners here. We didn’t expect it after what happened back home but they gave their best,” he added. Richard Willmott, 43, who won a bronze in bowling hails from Christchurch and the team made sure to connect him to his parent and relatives back home to put him at ease ahead of his event. “It was pretty good to win a medal. I spoke to my sister and also visited the Grand Mosque. It was very emotional,” said Willmott, whose compatriots Katie McMillan and David Nixon also won respective silver and bronze medals in 10-pin bowling, also expressed their happiness in dedicating their medals to the victims’ families. Dominic Faherty, who has provided the team’s only gold medal so far in 200-metres, was lost for words, but said: “I felt good to win gold” while showing a big thumbs up. The biggest challenge that Team New Zealand’s delegates faced was how to tell their determined athletes what had happened back home, as they were worried about how it would effect them. “The head of delegation Alan Robson spoke to the coaches first and then we had to decide how to put it across to the players,” said team spokesperson Carolyn Young. “Some athletes were in Abu Dhabi, and others were in Dubai, and obviously we didn’t know how they would react to the tragedy. “Though it has been a shocking and emotional moment for all of them, they have coped with it well and are focusing on the task at hand, trying to give it their best,” she added. Robson hailed the solidarity shown by the UAE government to inviting them to the Shaikh Zayed Grand Mosque. “Holding hand-in-hand with our UAE counterparts and showing solidarity was very emotional,” said Robson. “It was indeed special in these testing times. Everyone we have met are showing their support, which is very heartwarming,” he added. “The response in the UAE to the tragic terrorist attack in New Zealand has been overwhelming, including formal messages of condolence from UAE leadership, buildings lit up with the New Zealand flag, and the wider Emirati community expressing their feelings on social media. “I had the opportunity to join the UAE and NZ Special Olympics athletes at the Shaikh Zayed Grand Mosque on Saturday evening where we spent time reflecting on events in Christchurch. This was very moving and quite emotional. The messages of diversity, inclusion and tolerance that I heard at the opening ceremony in Zayed Stadium on Thursday night were amplified as we stood together hand in hand in the middle of the Grand Mosque. “While we visited the mosque I was aware that New Zealand has also witnessed an outpouring of public grief. Vigils have been held across the country, with tens of thousands coming together in solidarity and mourning. My own family in New Zealand visited a mosque in Hamilton that same evening to leave a tribute. “There are 5,000 New Zealanders who are living in the UAE. It will be difficult for them being apart from their families in New Zealand. I encourage New Zealanders here to get in touch with each other and share what’s going on. It is also possible for them to make online donations to the victims and families in New Zealand.